I returned home from Salt Lake City at 3:30 a.m. this morning. Although very tired, I had a wonderful trip. I shared ideas with some of the 6000 attendees, swapped cards and 3D items for new projects. The best part was getting the brand new Stampin'Up Fall-Winter idea book and catalog. The new catty is full of new stamp sets, 6 new In Colors, beautiful ribbons and designer papers and five new punches. PLUS, not featured in the catalog but a separate catty is the sleek black SU Sizzix BigShot machine and exclusive Stampin'Up dies. WAHOO !!! Never disappointed with convention, this year was especially nice because SU celebrates their 20th year. The products are sold in 7 countries by almost 50,000 demonstrators. The company processes and ships 4000 orders per day and most are shipped by UPS. Speaking of UPS, I am now anxiously awaiting delivery of the several boxes of catalogs ordered in July and due this week. The above picture has a lot of meaning. My one downline, Debi went with me to Salt Lake to experience her second convention. She surprised me with the hat for me to wear on day one of convention. 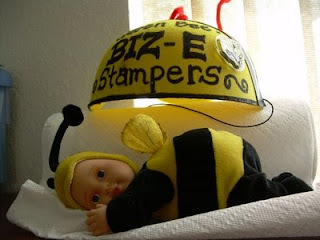 She also gave me the little stuffed bee as a remembrance of this convention symbolizing the name of my group Biz-E-Stampers. I am very blessed to have wonderful downlines. Right now would be the perfect time to join the group. Ask me about the promotion starting on the 12th. Further, the regional is in Orlando in January so you would be able to participate a day long Stampin'Up event in 6 months.